Home » Certified Financial Planner Boise ID » Is the stock market sliding? Is the stock market sliding? Posted by Peggy Farnworth on Oct 18, 2018 in Certified Financial Planner Boise ID, Certified Senior Advisor Boise ID, Financial Advisor Boise ID, Financial Planner Boise ID, Financial Planners Boise ID, Financial Planning Consultant Boise ID, Financial Services Advisors Boise ID, Peggy's Pearls | Comments Off on Is the stock market sliding? Have you been watching the stock market slide since hitting a record high in early October? 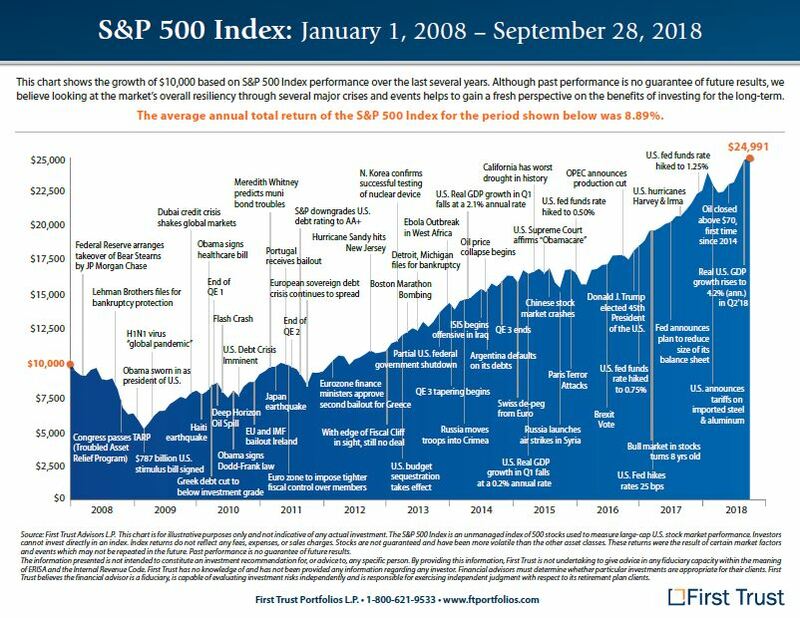 The chart shows the last 10 years of activity in the market starting with 2008. It reflects all the trauma and drama we have seen over the last 10 years. All the reasons not to invest in the stock market. Yet if you had invested $10,000 at the time it would now be worth almost $25,000. A return of 8.89%. The S&Ps record high on 10/1/18 of 2,924.69 dropped over 10 days to $2,728.37, a change of 6.7%. The numbers for the DOW look scarier. The record high of 26,828.39 on 10/3/18 slid to 25,052.83 on 10/11/18. A correction of almost 1,800 points. Yet the percentage of change is 6.62%. About the same as the S&P correction. It is the percentage of change that is important to monitor. The media will focus on the drop-in points-1,800 points sounds scarier than 6.62%. “Securities and advisory services offered, in states where licensed, exclusively through representatives of KMS Financial Services, Inc., Member FINRA http://www.finra.org SIPC http://www.sipc.com and an SEC http://www.sec.gov Registered Investment Advisor.